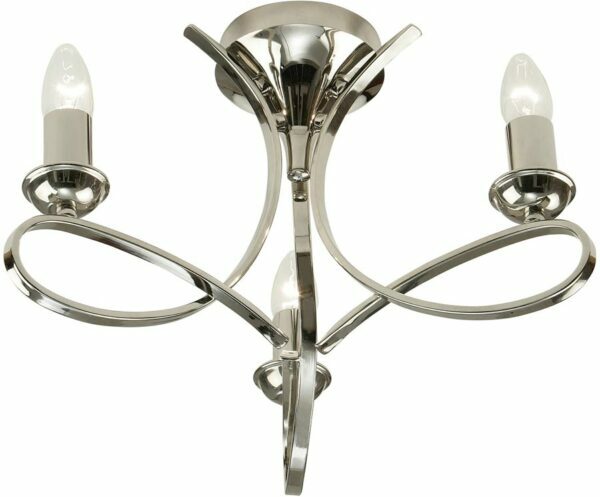 The Penn contemporary 3 lamp polished nickel semi flush light incorporates elegantly curved arms and is finished in a highly polished nickel. An opulent fitting with a modern twist on a traditional theme, featuring the best in British design. A wonderful 3-light semi flush ceiling fitting finished in polished nickel. Short drop ceiling mount and sweeping curved ribbon arms, with polished nickel candle pans and candle tubes. This is a compact light fitting that mounts close to the ceiling, suitable for smaller rooms with limited ceiling height. The Penn contemporary 3 lamp polished nickel semi flush light, part of the New Classics collection, designed and manufactured by Interiors 1900.